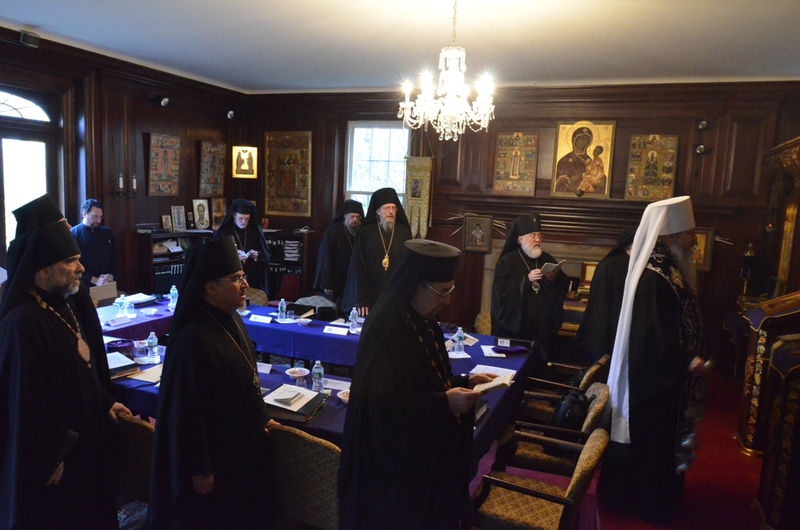 Members of the Holy Synod of Bishops of the Orthodox Church in America gathered in Saint Sergius of Radonezh Chapel at the Chancery here on the morning of Thursday, March 20, 2014, to offer prayers for His Eminence, the newly departed Metropolitan Philip of the Antiochian Orthodox Christian Archdiocese of North America. His Beatitude, Metropolitan Tikhon, presided at the Panikhida celebrated for the repose of Metropolitan Philip’s soul. Additional information will be posted on the OCA web site as it is received. According to the Antiochian Archdiocese’s web site, Metropolitan Philip was born on June 10, 1931, in Abou Mizan, Lebanon, the fourth of five children to Elias and Saleema Saliba. After completing his primary education at the Shouier Elementary School, he entered the Balamand Orthodox Seminary, near Tripoli, Lebanon, at the age of fourteen. He subsequently attended and was graduated from the Orthodox Secondary School in Homs, Syria, and the Assiyeh Orthodox College in Damascus, Syria. Ordained to the holy diaconate in 1949, he was assigned to serve as secretary to His Beatitude, Alexander III (Tahan), the Patriarch of Antioch and all the East. In 1952, he was appointed lecturer in Arabic language and literature and student advisor at the Balamand Orthodox Seminary. While a deacon, Metropolitan Philip was awarded a scholarship and invitation to undertake studies in Great Britain at the Kelham Theological School and the University of London. In 1956, he arrived in the United States and enrolled at Holy Cross Greek Orthodox School of Theology in Brookline, Massachusetts. Assigned to a position at Saint George Church in Detroit, Michigan, he entered Wayne State University from which he was graduated with a Bachelor of Arts degree in 1959. On March 1, 1959, he was ordained to the holy priesthood by Metropolitan Antony (Bashir) and assigned to the pastorate at Saint George Church in Cleveland, Ohio. While serving in this capacity, he carried to completion the building of an educational and cultural center for the parish. He also served in many religious and civic posts while in Cleveland, among them the Eastern Orthodox Welfare Council, the Television and Radio Commission of the Cleveland Area Church Federation, and the Mayor’s Civic Committee. He undertook graduate theological studies at Saint Vladimir’s Orthodox Theological Seminary in Crestwood, New York, and was graduated from that institution with a Master of Divinity degree in 1965. In March of 1966, the Antiochian Archdiocese, meeting in special convention, nominated Philip Saliba to succeed the late Metropolitan Antony (Bashir) as Archbishop of New York and Metropolitan of all North America. In July of that year, the Patriarchal Vicar for the widowed See of New York, Metropolitan Ilyas(Kurban), Archbishop of Tripoli, Lebanon, elevated Philip Saliba to the dignity of Archimandrite. He was elected for the See of New York by the Holy Synod of the Antiochian Patriarchate on August 5, 1966, and on August 14 was consecrated to the episcopacy by Patriarch Theodosios VI (Abourjaily) at the Monastery of the Prophet Elias in Dhour Shouier, Lebanon. Metropolitan Philip was enthroned at his Cathedral of Saint Nicholas in Brooklyn, New York, on October 13, 1966. On June 24, 1975, Metropolitan Philip and Archbishop Michael (Shaheen) of Toledo, Ohio, accomplished the administrative and jurisdictional unity of the Antiochian Orthodox faithful in North America. This unity was ratified by the Holy Synod of the Patriarchate on August 19, 1975. The canonical praxis, issued by Patriarch Elias IV (Mou’awad), named Metropolitan Philip as Primate of the Antiochian Orthodox Christian Archdiocese of North America. Metropolitan Philip has a keen interest in Middle Eastern affairs and is recognized as an expert in this field. As a student at Wayne State University, he served as President of the Arab Student Federation and in Cleveland, he was a member of the Committee on American Policy in the Near East. He has met with United States Presidents, Eisenhower, Johnson, Ford, Carter and Reagan, as well as with Pope Paul VI and Pope John Paul, II and many other world leaders on behalf of a just and durable peace in the Middle East. At present, he serves as chairman of the Standing Conference of American-Middle Eastern Christian and Moslem Leaders which represents the two million Americans of Arabic heritage. In 1968, he established a $100,000 Trust Fund to provide scholarships to Arab refugees studying in the fields of science, medicine, economics and technology. In 1977, he established a $500,000 endowment fund for the support of the Orthodox Theological Academy of St. John of Damascus at Balamand Lebanon, the sole remaining Orthodox Seminary in the Middle East. Since the Israeli-Arab conflict of 1967, Metropolitan Philip has inaugurated a number of fund-raising campaigns to provide food, shelter and medical assistance to Arab refugees and victims of war. Under his leadership, the Archdiocese has also undertaken numerous charitable campaigns to aid victims of disasters in the United States and throughout the world. For his many charitable deeds and renowned humanitarian concern, Metropolitan Philip has been commended and decorated by many governments. Some of these awards include the Commander’s Badge of the Lebanese Order of the Cedars and the First Class of the Order of Civil Merit of the Syrian Arab Republic. Awards presented to him by ecclesiastical authorities include the Order of the Bush Unburned from the Archbishopric of Mount Sinai, the Cross of Lebanon from the Archdiocese of Mount Lebanon and the Order of Saint Mark from the Patriarchate of Alexandria and all of Africa. In 1981, the Trustees and faculty of Saint Vladimir’s Orthodox Theological Seminary awarded Metropolitan Philip the degree of Doctor of Divinity, honoris causia. On May 5, 1986, the Metropolitan’s Alma Mater, Wayne State University of Detroit, Michigan, awarded him an honorary degree of Doctor of Humane Letters. On May 20, 1995, Holy Cross School of Theology bestowed upon Metropolitan Philip, the Honorary Doctor of Divinity Degree in recognition of his sterling leadership provided to the Antiochian Archdiocese and Orthodoxy at large. On May 26, 2007, he was awarded the Doctor of Divinity “honoris causa” by Saint Tikhon’s Orthodox Seminary in South Canaan, Pennsylvania. In conjunction with the 100th Anniversary of the Statue of Liberty in 1986, he was one of the few Americans chosen to receive the cherished “Liberty Award” which was presented to him by Mayor Koch of New York City on July 1. On May 21, 1994, His Eminence received the Ellis Island Medal of Honor. On September 27, 2007, His Eminence was awarded the Lebanese Order of Merit by President Emile Lahoud of Lebanon. His Eminence is the author of The Eucharist in the Primitive Church, Feed My Sheep, He Leads Them, and a number of poems and meditations, and is the co-author of Out of the Depths Have I Cried. He has also written many articles and monographs in the fields of theology and Middle Eastern affairs. Fluent in English and Arabic, and having a knowledge of French and Greek, His Eminence has translated many literary works into Arabic. In February 1987, some two thousand (2,000) Evangelical Christians embraced the canonical Orthodox Church and the Antiochian Orthodox Christian Archdiocese of North America. This was made possible through the leadership of the Evangelical churches and His Eminence, Metropolitan Philip. They bring with them their strong desire to bring Orthodoxy to America. In 2003, a truly historic event occurred under the leadership of Metropolitan Philip. The Archdiocese of North America requested, and was granted by the Holy Synod of Antioch the status of a self-ruling archdiocese. In conjunction with this event, the archdiocese established a diocesan structure, and elected three new Diocesan Bishops who were consecrated by His Beatitude Ignatius IV in the Patriarchal Cathedral in Damascus, Syria. Metropolitan Philip served as First Vice Chairman of the Assembly of Canonical Orthodox Bishops of North and Central America, Vice President and Vice Chairman of Saint Vladimir’s Orthodox Theological Seminary Board of Trustees, and Chairman of the Orthodox Christian Education Commission. Additional information, including links to Metropolitan Philip’s writings, may be accessed at www.antiochian.org/MetropolitanPhilip.